CORPUS CHRISTI, TX – Enter our house of horrors if you dare! 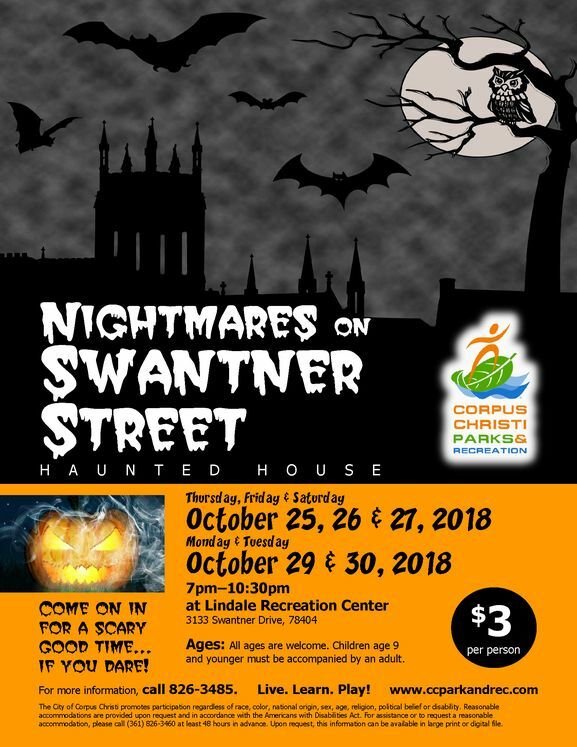 The Corpus Christi Parks & Recreation Department invites you to step inside for Nightmares on Swantner Street. Our haunted house will open Thursday - Saturday, October 25, 26 & 27, and the following Monday and Tuesday, October 29 & 30, from 7:00 p.m. to 10:30 p.m. at the Lindale Recreation Center, 3133 Swantner Drive. Admission is $3 per person and children ages nine and younger must be accompanied by an adult. For more information, call (361) 826-3485 or (361) 826-PLAY.